and a tiny bit of purple Stickles in the flower centers. Beautiful! I love how you rotated the sketch! What a lovely card! Lovely details, yet so CAS! SO beautiful! I love the die you used, it has created the perfect backdrop for your stunning flowers. Your coloring looks amazing! Thanks for joining us at Less Is More! 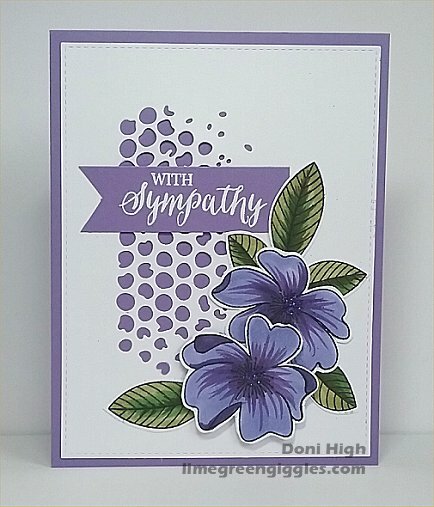 So perfect for a sympathy card. That die is beautiful as a background to those gorgeous flowers. Congrats on your win, Doni. I love how you used the stencil for the background.